This day in 1948, only months after India gained independence, Mohandas Gandhi died when an assassin, a Hindu named Nathuram Godse, angered by Gandhi's benevolence towards Muslims and betrayed the Hindu cause, shot him point blank in New Delhi. Mohandas Karamchand Gandhi, called Mahatma or "Great Soul," led a non-violent, civil disobedience campaign against the oppressive British Raj which led to India's independence in 1947. Mohandas K. Gandhi was quoted to have said "If I am to die by the bullet of a mad man, I must do so smiling. There must be no anger within me. God must be in my heart and on my lips." This was on January 28, 1948, two days prior to his assassination. 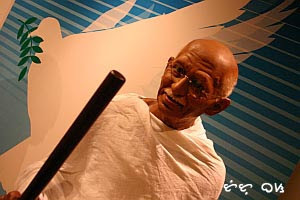 At Madame Tussauds Hong Kong, Mahatma Gandhi is honored by a wax figure on display. This day, ashes of the great leader were scattered on the shores of Mumbai on the Arabian Sea, sixty years after his death. Tutubi honors great people of history who gave their lives for the good of others! According to the official website of Mani Bhavan, "Mahatma Gandhi lived in this quaint Gujarati-style house from 1917 to 1934, and it was here in November 1921 that he conducted a 4-day fast in order to restore peace to the city. This quiet three-story home on a beautiful Laburnum tree-lined avenue now preserves the spirit of the man who selflessly put his nation before himself. 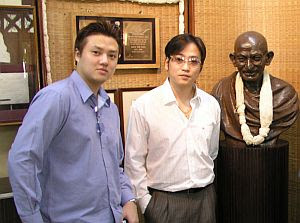 There's a library of Gandhi-related works, as well as displays of photographs, posters, slogans, and other items that document and explain Gandhi's legendary life; dioramas depicting major events and turning points in his fight for the nation's freedom draw particular attention to his devotion to the poor. You can see Gandhi's old charkha (spinning wheel), which in many ways symbolized the struggle for independence, as it represented a return to roots and to sustainable home industry, where anyone can weave his or her own cloth. A visit to this tranquil spot makes a welcome change from the continuous hubbub of life in Mumbai -- go up to the roof to really appreciate the relative stillness of the surrounding neighborhood." i don't know how he did it, you know... ghandi is really inspiring and there never will be another like him. we know it. What a great contribution to a very important and significant man in the world showing the way to peace in a unique way - thanks for reminding and sharing this! Wow!I'm super envy with your travel galore tutubi! I want to visit India,too. I have also wanted to see that movie, Gandhi, starring the great Ben Kingsley. I see it at our video stores here, just might rent it when I get the chance. I had no idea who Gandhi was until I was assigned to do a write-up about him when I was a freshman in college. I was impressed and awed by the man, and I still am. He is one of a kind. One of the great epics of all time, is this old old movie, Gandhi.